Apply mechanical engineering principles and theories to enhance your skills through formal education and training, and independent inquiry. The mechanical engineering masters prepares graduates to support the design of engineered systems through the application of the fundamental knowledge, skills, and tools of mechanical engineering. Students will work independently as well as collaboratively with leaders in industry, while demonstrating the professional and ethical responsibilities of the engineering profession. Ultimately, graduates will enhance their skills through formal education and training, independent inquiry, and professional development. The program requires 30 credit hours. In addition to the two required courses, students choose three courses from nine different focus areas and four elective courses. All full-time equivalent students are required to attend graduate seminar weekly for each semester they are on campus. Up to three courses may be taken outside the mechanical engineering department. Students may complete the program's requirements within one calendar year with summer study. Students may also augment their education through cooperative education employment opportunities. Although co-op is not a requirement of the program, it provides students an opportunity to gain valuable employment experience within the field. Risa Robinson has taken a different approach to assessing e-cigarette usage, and it’s turned up some attention-getting results. Robinson studies users in their own environments, puffing on their own e-cigarettes, rather than on test machines in lab settings. And what she’s found is that they are puffing as much, if not more, than traditional cigarette users, resulting in potentially higher exposure to harmful substances. Associate Professor Kathleen Lamkin-Kennard’s students are learning to understand motion and to replicate it through technology that might mean mobility for individuals who may not have had that option before. Advanced Engineering Mathematics provides the foundations for complex functions, vector calculus and advanced linear algebra and its applications in analyzing and solving a variety of electrical engineering problems especially in the areas of control, circuit analysis, communication, and signal/image processing. Topics include: complex functions, complex integration, special matrices, vector spaces and subspaces, the nullspace, projection and subspaces, matrix factorization, eigenvalues and eigenvectors, matrix diagonalization, singular value decomposition (SVD), functions of matrices, matrix polynomials and Cayley-Hamilton theorem, state-space modeling, optimization techniques, least squares technique, total least squares, and numerical techniques. 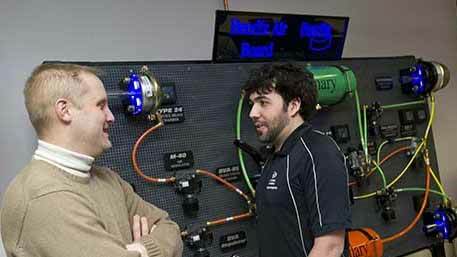 Electrical engineering applications will be discussed throughout the course. This course number is used by students in the master of engineering degree program for earning internship credits. Students must submit a proposal for the internship, to be approved by an employing supervisor and the department prior to enrolling. Students are required to submit an evaluation report at the conclusion of the internship. This course is used by students in the master of engineering degree program for conducting an independent project. The student must demonstrate an acquired competence in an appropriate topic within mechanical engineering. The topic is chosen in conference with a faculty adviser. The work may involve an independent research and/or a design project and/or literature search with a demonstration of acquired skill. A written paper, approved by the advisor and the department, and an oral presentation of the work are required. This course introduces students to research methods in mechanical engineering. A primary focus of the course is on conducting critical reviews of research literature, preparing a formal thesis proposal, and initiating background research on a thesis topic. At the conclusion of the course, the students are expected to submit a formal thesis proposal, literature review, and plan of study for the completion of the Master of Science degree. This course is specifically designed for students enrolled in the dual degree MS/BS program offered through the department. This seminar course presents topics of contemporary interest to graduate students enrolled in the program. Presentations include off campus speakers, and assistance with progressing on your research. Selected students and faculty may make presentations on current research under way in the department. All graduate students enrolled full time (whether dual degree or single degree) are required to attend a designated number of seminars. * Design Project Leadership (MECE-730) is reserved only for students enrolled in the accelerated BS/M.Eng. program. † Internship (MECE-777) is optional for all ME students. ‡ Project (MECE-792) is an option for all ME students and students enrolled in the accelerated BS/MEng program. § Research Methods (MECE-701) is intended for students planning to transition to the MS degree. 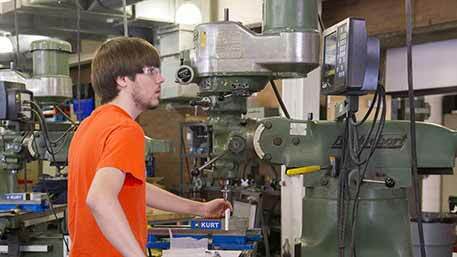 Course reviews operating principles of prevalent processes such as casting, molding, and machining. Students will use this knowledge to select appropriate production processes for a given component. For each process covered, guidelines governing proper design for manufacturability practices will be discussed and applied. This course will introduce the analysis and design of power transmission systems. Topics covered include spur, helical, bevel, and worm gears, gear trains, planetary gear systems, power transmission shafts, belt and chain drives. The transmission of power at the required speed and torque is the primary function of most power transmission systems, and is the focus of this course. Students will use this foundation to complete a case study project whereby they review and analyse how power is transmitted from the primary source to the remainder of the driveline by means such as manual transmissions, automatic transmissions, continuously variable transmissions, and direct drive systems. The course focuses on the fundamentals of ground vehicle motion, control, and stability. The structure, stiffnes, and mechanisms by which tires generate longitudinal and lateral forces and self-aligning moments are discussed. Steering geometry and steady-state and transient steering response for bicycle and four-wheel vehicle models are analyzed. The effect of suspension geometry and stiffness on stability and ride are discussed. Transmission system design to match engine characteristics and achieve required vehicle performance is discussed. This course introduces students to the study of linear control systems, their behavior and their design and use in augmenting engineering system performance. Topics include control system behavior characterization in time and frequency domains, stability, error and design. This is accomplished through classical feedback control methods that employ the use of Laplace transforms, block diagrams, root locus, and Bode diagrams. An integrated laboratory will provide students with significant hands-on analysis and design-build-test experience. Is concerned with analytically finding the dynamic characteristics (natural frequencies and mode shapes) of vibratory mechanical systems (single-degree and multi-degrees of freedom systems), and the response of the systems to external excitations (transient, harmonic, and periodic). Application to vibration damping techniques (Dynamic Vibration Absorbers) is also covered. In addition, laboratory exercises are performed, and an independent design project is assigned. This course provides an overview of the potential alternative fuels and energy efficiency technologies for powering current and future vehicles. Alternative fuel production technologies and utilization of fuels such as biodiesel, ethanol, and hydrogen will be covered. The primary technical and environmental issues associated with these alternative fuels will be discussed. Approaches to improving vehicle efficiency will also be explored. Students will be responsible for a final design or research project. This course provides an overview of the role of fluid-film lubrication in mechanical design, with strong emphasis on applications. Various forms of the Reynolds equation governing the behavior of lubricant films for planar, cylindrical, and spherical geometry are derived. Mobility and impedance concepts as solution methods of the Reynolds equation are introduced for the performance assessment of lubricated journal bearings under static and dynamic loading. Short, long, and finite bearing assumptions are discussed. Finite element methods for the analysis of fluid-film bearings of arbitrary geometry will be introduced. An analysis of comparative global business behavior and organization with particular emphasis on values, authority, individual and group relations, labor-management ties, risk tolerance, and motivational techniques. The course will prepare students to recognize different values and cultural factors in the global business community and how these shape and determine appropriate management behavior. The problems and opportunities of transferring management practices from one culture to another will also be examined. This course deals with a complete description of physical systems its analysis and design of controllers to achieve desired performance. The emphasis in the course will be on continuous linear systems. Major topics are: state space representation of physical systems, similarities/differences between input-output representation (transfer function) and state spate representations, conversion of one form to the other, minimal realization, solution of state equations, controllability, observability, design of control systems for desired performance, state feedback, observers and their realizations. This course will provide an introduction to the analysis and design of robust feedback control systems. Topics covered: overview of linear algebra and linear systems, H2 and H( spaces, modeling and paradigms for robust control; internal stability; nominal performance (asymptotic tracking); balanced model reduction; uncertainty and robustness; H2 optimal control; H( control; H( loop shaping; controller reduction; and design for robust stability and performance. The course covers different optimization techniques, as applied to feedback control systems. The main emphasis will be on the design of optimal controllers for digital control systems. The major topics are: Different performance indices, formulation of optimization problem with equality constraints, Lagrange multipliers, Hamiltonian and solution of discrete optimization problem. Discrete Linear Quadratic Regulators (LQR), optimal and suboptimal feedback gains, Riccati equation and its solution, linear quadratic tracking problem. Dynamic Programming - Bellman's principle of optimality - Optimal controllers for discrete and continuous systems - Systems with magnitude constraints on inputs and states. This course is designed to introduce the student to advanced systems modeling techniques and response characterization. Mechanical, electrical, fluid, and mixed type systems will be considered. Energy-based modeling methods such as Lagrange’s methods will be used extensively for developing systems models. System performance will be assessed through numerical solution using MATLAB/Simulink. Computer projects using Matlab/Simulink will be assigned and graded in this course including concepts of data analysis and how it performs to parmeter estimation. Linearization of nonlinear system models and verification methods are also discussed. This course builds on the fundamentals of continuous feedback control to introduce the student to computer (digital) regulation of systems in closed-loop. Discrete-time modeling and stability of signals and systems are discussed. Analog and digital control schemes are compared using s domain to z-domain conversion, and time-domain response characterization. Closed-loop system design objective specification and evaluation is conducted through numerical simulation and experimental observation. Various discrete-time controller designs are implemented and evaluated using Matlab/Simulink. A series of experimental excercises included using concepts throughout the course on an embedded controller. This course introduces the student to methods used to design advanced nonlinear control systems. Topics of this course include: Phase-State Plane Analysis, Existence of Limit Cycles, Lyapunov Stability (Direct and Indirect methods), nonlinear control design using Feedback Linearization, the Sliding Mode Control method, Numerical Optimization of PID laws, and Adaptive Control strategies. Students are expected to complete computer projects using Matlab/Simulink. The focus of this course is Lean. Lean is about doing more with less - less human effort, less equipment, less time, less space. In other words, lean is about the application of industrial engineering principles and tools to the entire supply chain or value stream. The focus of this course will be learning and applying the principles and tools of lean such as value, value stream mapping, takt, flow, pull, kaizen, standard work, line design, and others, all in the context of continuous process improvement. By the end of this course, the student will possess the essential tools and skills to apply lean in their production system from either a line (supervisor or manager) or staff role. This course will cover the role, the steps and the analysis methods to produce goods and services in support of the production and operations management functions. Topics include: forecasting, inventory policies and models, production systems and philosophies (e.g. JIT/Lean), job shop scheduling, aggregate production planning, and Material Requirement Planning (MRP). Students will understand the importance of production control and its relationship to other functions within the organization. Case studies and the design of actual production systems will be emphasized. This course begins with an introduction to commercial rapid prototyping processes, the materials involved, and the physics behind how they work. The course then transitions to research topics involving novel processes, applications, and materials. Class activities include a mix of lecture, lab, and project work. This course will provide an introduction to concepts and techniques in the design and analysis of production systems. A blend of traditional and modern approaches is brought into the classroom. At the end of the quarter, the student will be able to assess and analyze the performance of a given manufacturing system as well as to provide a framework for system redesign and improvement. Modern aspects such as lean manufacturing and setup time reduction are included in the context of the course. This course focuses upon theoretical and applied concepts pertaining to the finite element method. Direct and weighted residual formulation methods are derived and applied to problems in the area of structural analysis, fluid flow, and heat transfer. Foundational topics include shape functions, element formulation, element assembly, boundary conditions, matrix solution methods, mesh refinement, and convergence. The use of a standard commercial finite element software package is introduced. This course is an introduction to basic optimization techniques for engineering design synthesis. Topics covered include: techmiques, the general problem statement, necessary conditions of optimization, numerical techniques for unconstrained optimization, constrained optimization through unconstrained optimization, and direct methods. Numerical solutions are obtained using MATLAB.software. A design project is required. This course is an introductory course to the fundamentals and applications of composite materials. Topics covered include constituents of composite materials, fabrication techniques, micromechanical analysis, macromechanical analysis, and the use of composites in design. Some laboratory work is to be performed, and a design project is required. This course provides an overview of materials used in biomedical applications. Topics covered include structure and properties of hard and soft biomaterials, material selection for medical applications, material performance and degradation in hostile environments, and typical and abnormal physiological responses to biomaterials/environments. Some experiments will be performed in class and a major project is required. This course provides a more advanced treatment of stress and strain concepts pertaining to the mechanics of deformable media and provides a theoretical foundation for a concurrent or follow-on course in finite elements. Topics include stress and strain transformations, two-dimensional theory of elasticity, stress functions, torsion, plate bending, and energy methods. This course addresses decision making in the face of risk and uncertainty. Various methodologies will be introduced that are useful in describing and making decisions about risks, with particular emphasis on those associated with the design of products. Students will be exposed to issues related to balancing risks and benefits in situations involving human safety, product liability, environmental impact, and financial uncertainty. Presentations will be made of risk assessment studies, public decision processes, and methods for describing and making decisions about the societal risks associated with engineering projects. Topics include probabilistic risk assessment, cost-benefit analysis, reliability and hazard analysis, decision analysis, portfolio analysis, and project risk management. The engineering of a system focuses on the overall concept, performance, requirements and behavioral aspects of the system. This course builds on the concepts discussed in Engineering of Systems I. Topics include concept generation and innovation techniques, outsourced product development, requirements engineering and management, critical parameter management, robust design and latitude development, quality by design, advanced product development project management, and lean product development. Students will learn several systems analysis techniques and may include a team based project. This course, Sustainable Energy Management and the Built Environment, provides an overview of mechanical and associated control systems within buildings with an emphasis on sub-systems which possess the most visible energy signature in terms of energy usage, energy inefficiency, and societal/global impact. Fundamentals of system operation are explored as well as energy management techniques. Using domestic and international case studies which highlight energy management within the built environment, students will explore methods by which engineers have achieved solutions aligned with sustainability. This course will provide the student with systematic approaches for designing and developing environmentally responsible products. In particular, design trade-offs will be explored. This is a one-semester introductory graduate course that introduces and develops fundamental understanding of the flow dynamics of blood. The course includes a discussion of basic fluid mechanics, blood rheology, and biological regulation of blood flow. Emphasis will be placed on developing a physical understanding of each of the fundamental ideas and how it is applied to microcirculation and cutting-edge biomedical research. Applications of state-of-art micro/nanotechnologies such as microfluidics in the study of microcirculation, tissue engineering, and blood diagnostic will be also discussed in the class. The course is also open to undergraduate students who have taken courses in fluid dynamics, e.g., MECE (210)-Fluid Mechanics I, BIME (320)- Fluid Mechanics or equivalent, and are interested in blood flow and related biomedical engineering technologies. This course covers the basics of introduction to Computational Fluid Dynamics (CFD) n fluid mechanics and heat transfer. CFD methods of flow modeling are introduced with emphasis of in-class use of CFD software for modeling and problem solution. Course work involves tutorials and design examples. This course also introduces the students to some of the commercial CFD codes being used for solving thermal-fluid problems. Students complete an individual CFD study project including a written report and a presentation of the results. This course covers the fundamental topics in the theory of aerodynamics and high speed flows. The course discusses modern aerodynamic applications in the areas of wing and airfoil design, wind tunnel testing and compressible flows. This course introduces the student to the flow of real incompressible fluids. The differential approach is used to develop and solve the equations governing the phenomena of mass, momentum, and heat transfer. The material in the course provides the necessary background for a study of computational fluid dynamics. Is concerned with analytically finding the dynamic characteristics (natural frequencies and mode shapes) of continuous mechanical vibratory systems (strings, rods, and beams), and the response of the systems to external excitations (transient and harmonic). Solutions using the finite element method is also introduced. In this course the student is introduced to random variables and stochastic processes. Topics covered are probability theory, conditional probability and Bayes theorem, discrete and continuous random variables, distribution and density functions, moments and characteristic functions, functions of one and several random variables, Gaussian random variables and the central limit theorem, estimation theory , random processes, stationarity and ergodicity, auto correlation, cross-correlation and power spectrum density, response of linear prediction, Wiener filtering, elements of detection, matched filters. In this course, the student is introduced to the concept of multi rate signal processing, Poly phase Decomposition, Transform Analysis, Filter Design with emphasis on Linear Phase Response, and Discrete Fourier Transforms. Topics covered are: Z- Transforms, Sampling, Transform Analysis of Linear Time Invariant Systems, Filter Design Techniques, Discrete Fourier Transforms (DFT), Fast Algorithms for implementing the DFT including Radix 2, Radix 4 and Mixed Radix Algorithms, Quantization Effects in Discrete Systems and Fourier Analysis of Signals. Hold a baccalaureate degree (or equivalent) from an accredited university or college in mechanical engineering, physics, or a related field. Submit official transcripts (in English) from all previously completed undergraduate and graduate course work. International students are required to submit scores from the GRE. Minimum scores of 302 (V&Q) and 3.0 (writing) and required.